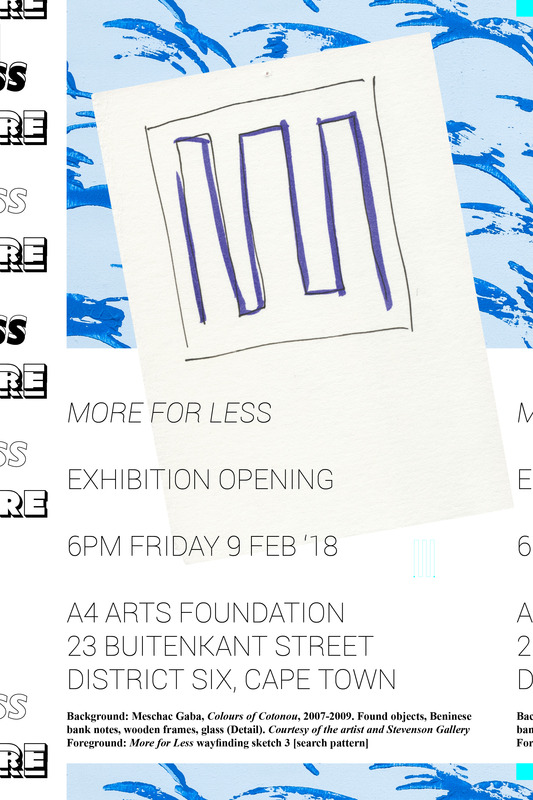 More For Less is a group exhibition curated by Josh Ginsburg. 'More for Less' is bookended on the one limit by artists who mutate the mundane into the poetic through micro gestures – on the other by those who render sprawling, complex, conceptional enquiries into refined forms. Wandering after soft touches, subtle contortions and oblique interventions, here are works and practices that engage with residue and offcuts, transactions, propositions, and serious play. With works by Walter Battiss, Pierre Bismuth, Edson Chagas, Peter Clarke, Christo, Kemang Wa Lehulere, Barend de Wet, Turiya Magadlela, Ane Hjort Guttu, Meschac Gaba, Kristjan Gudmunsson, Bronwyn Katz, Ernest Mancoba, Unathi Mkonto, Kyle Morland, Christian Nerf, Jo Ractliffe, Borna Sammak, Jared Ginsburg, Viviane Sassen, Lyall Michael Sprong, Danh Vo, Erwin Wurm, James Webb, Maurizio Cattelan, Yves Klein.